As regular readers of this blog will know, over 5 years of work culminated in the layout's first public show on Saturday. Indeed this was the show known as 'Europe's premier narrow gauge exhibition'. It was a dream come true and I am very proud of what I achieved, with help from many people, including significant work on the loco side from my Dad. However, it probably wasn't a great idea to have made expoNG the first exhibition, as we had some fun and games! In the rush to complete the layout, testing got squeezed and squeezed. When I was finally ready to finally test all boards together it was Thursday. Problems were found with short circuits (a big problem in DCC) on two boards. These were brought inside and the problem solved (wires slightly touching where they are fed close to each other on the tortoise motor connectors). However there was no time left after that to test the layout electrically, let alone test running, before it was to be transported south. 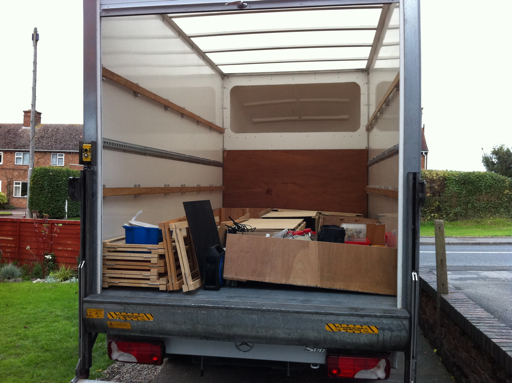 On the Friday everything went well and the van drove fine despite the M25 traffic and we got the layout erected that evening, but again there was no time to test it. On the Saturday we arrived as early as possible and began to test. Nightmare! The dreaded short circuit problem was back. It took us over 2 hours to find the problem having isolated the issue to the platform board - 4 bits of straight track, how could that be the problem? After much re-gapping of copper clad sleepers and other investigative work I took the decision to start unsoldering feeds to try and find the problem. The first two wires I unsoldered fixed the problem! We still don't know the cause of the problem but suspect that it was to do with copper clad sleepers touching at board joins, the unsoldered feed meaning it must have been the long siding. All this meant that the first time a loco made it around the layout was a grand 4 minutes before the exhibition opened to the public! All this also meant that the time we had put aside to add decoders and test a couple of other locos was lost - no Merddin, 138 or 87 - sorry! We gradually built up the running, starting with just light engine movements. Issues with scenery fouling the stock were easily solved but frustrating for the crowd watching. 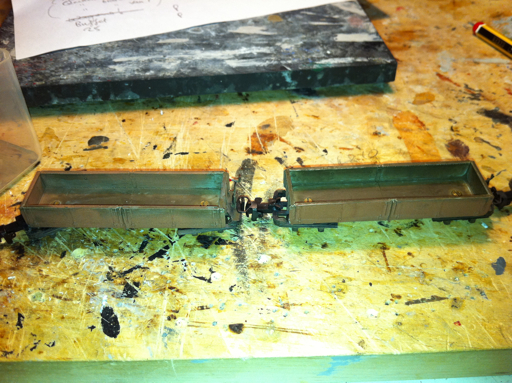 I also had to snip off the ends of the tortoise motor arms as they fouled on loco cow catchers. Worse was to come though as a number of carriages locked on the curves and caused problems and it was a tad embarrassing at times. However we soon took the carriages that were causing the problems out of service and everything settled down. That is until the only NGG16 we actually had running failed. The rear unit stopped completely and all attempts to solve the problem including outside thoughts were ultimately fruitless. Having now got the beast home, I have found that the motor is dead - how unlucky is it for that to happen during the exhibition! So, in the end we ran with a few really good diesels and a smaller than expected stock and by the afternoon things were looking up. The WHR/FR stand was also attracting much interest/questions too, so we did a good job of advertising the railways! We were also able to show 138 and K1, although not as runners. - The alignment at the north end of the platform is too complex, mainly caused by swapping from crazy to mainline peco points. This needs much more thought and at the moment I expect that I will extend the board by a foot or so and straighten out the end of the platform so that the curves out of the station are more manageable and the board joins are much closer to parallel to the board edge. - Certain carriages need greater gaps between adjacent carrs and changes to their pivots which on some do not allow the bogies to swivel easily enough. Washers, filing and a bit of oiling can solve this. - Some vehicles need extra weight, but we also need to be careful about the total weight of trains, as Vale of Ffestiniog couldn't pull 5 WHR saloons up the gradients on the layout. I would like to thank many readers of this blog and others who commented on the scenery and stock despite the running issues. Indeed it appears that railway modeller are interested in featuring the layout in a future issue too, so it must have looked alright. I was delighted by how it has turned out and was also pleased that the structure of the layout worked well, the overall lighting was good, the station lamps and point indicator lights worked well and generally the tortoises did their job. We also managed to take the layout down and pack it away in about an hour, which I thought was good for a layout of this size. Indeed we had some good fun - Gelert and the WHHR train was branded 'controversial' by a few and Castell Caernarfon ran superbly with it's DCC sound going well too, although the general noise in the hall made hearing it hard for most. It's hard work an exhibition, and I have much respect for those who do it often, I suppose this one was especially hard for us given the problems, but a team of 4 worked well and we all got to see a bit of the exhibition too. So I shall now be taking a break from 009 as I start a new job tomorrow. Any spare time until Christmas will be used to further 16mm projects, notably the De Winton before I return to 009 in the new year. I had a number of enquiries about other exhibitions, but really want to put right a lot of the issues found and that will take time. I expect therefore to next show Rhyd Ddu in Spring 2012. ﻿see you in the new year! - Russell will appear in brass only although this should be interesting like that?!? 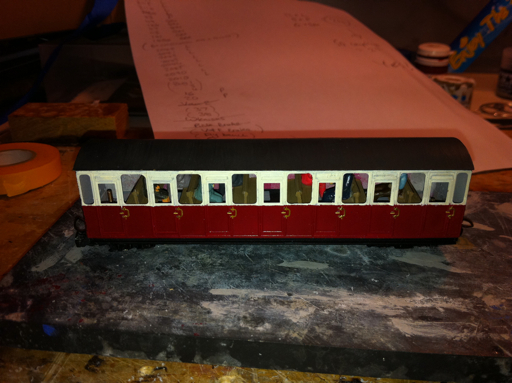 -Most carriages will not be glazed, have numbers/crests on or vac pipes. Time beat us. - the water towers will not feature strapping as I have decided to rebuild the supports in brass and solder it all together for extra strength. The plastic ones will be ok for now. There is much to be excited about though - blue, red and black ngg16s, k1 in satin black (but no lining), digital sound castell Caernarfon (tested and working well today), vale in two tone green, Upnor in the new livery in green/black although maybe not with the red lining and loads of carriages and wagons meaning some interesting consists! Do come along and say hi! Nailed down, connected and wired up. Really good progress this weekend! Also ALL board joins are now sorted, so with just a few minor electrical jobs to sort, testing can begin. Points and plain line track arrived here is draft 1 of the marshalling yard setup. Sorry for the lack of updates but it's frantic here and in glos. But below are some images showing amongst other things: the lighting supports installed, the new board incline added and modroc added on top and the mirror vinyl added at the end of the yard board. Getting there! 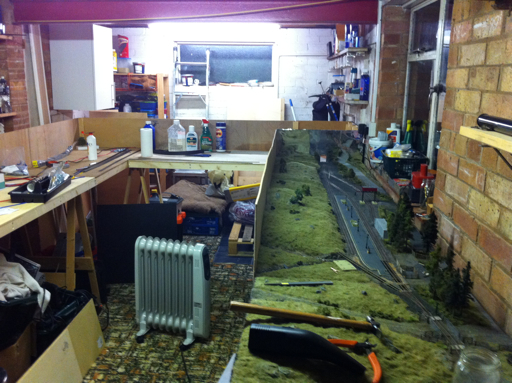 The layout has been erected today in a major garage reorganisation job. That is all boards except the fridd board as I have decided to add two more of the breakfast bar legs to that board to make putting the layout up easier. I am now starting the job of clamping together the new boards and drilling 10mm holes for the m10 bolts that act as alignment dowels. 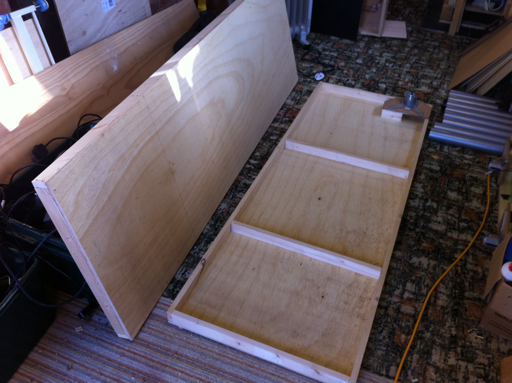 I've also sourced the incline risers for the new board (there is a 24mm height drop) and some more 6mm ply to create backscene pieces for the new boards. 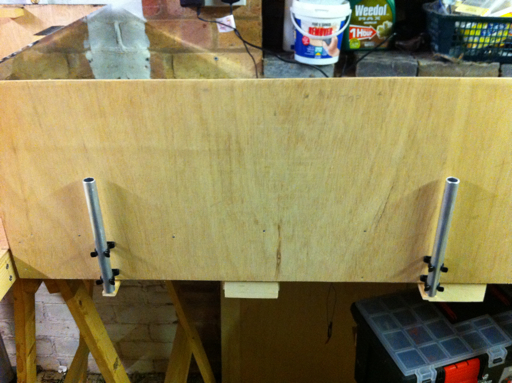 The Two new boards were constructed today and all the locating pieces for static legs repositioned (5 of the 9). Upstairs I booked the van for expoNG and also found time to drill holes for the Greenwich couplings to be used on the bugs everso often checking how many miners were safe - an incredible story just made for live tv news! 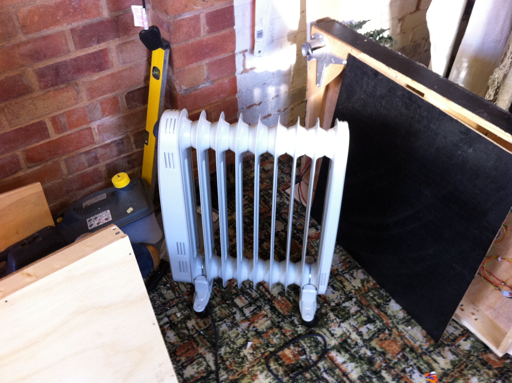 And if you're wondering what the second picture shows, I've bought an oil filled electric radiator to keep the garage at a suitable temperature! etch primer on chassis, satin black on body! nice! After a considerable time last night playing with the hidden sidings I have come to the conclusion that traversers will not be reliable enough for exhibition running. Aligning 6 lots of tracks up reliably with <1mm gaps is proving very troublesome and the extra strong magnets are not strong enough to align the tracks vertically, although they do a great job horizontally. Also the magnets as currently designed wouldn’t let the widest stock through, so a redesign would be necessary anyway, probably meaning the removal of one track from each 6 track traverser and realigning all the other roads further apart. ouch. I will exhibit Rhyd Ddu as a continuous run with a set of marshalling yards at the rear, one central hidden sidings if you like, rather than two traversers. This requires the construction of two new boards, 6 foot long each (which avoids the silly 2 foot square board and means the siding points will all be contained on one board). I’ve got all the legs I need and most of the wire so today I’ll start the woodwork and the track and points will be ordered soon (probably second hand N gauge stuff as it’s cheaper and it doesn’t matter when out of view). Boards a and b will eventually become scenic. c is the new marshalling yard and d exists already. Enjoyed a visit from the family for thomas' birthday today. This meant that dad and I had a chance to catch up. Super progress has been made on k1, Gelert now has sorted rods and 87 has been transferred south. Dad is to concentrate on Locos now. I have now been able to add couplings to carrs 23, 20, 16, 2115, 2060 and the flying bench. The latter having a coupling on just one end to allow it to be tagged on the back of a rake as a bit of a joke! 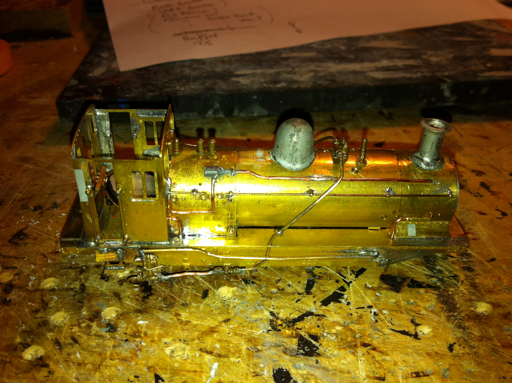 2100 has had bogies added and a coupling one end, but the obs end requires a specially long coupling. 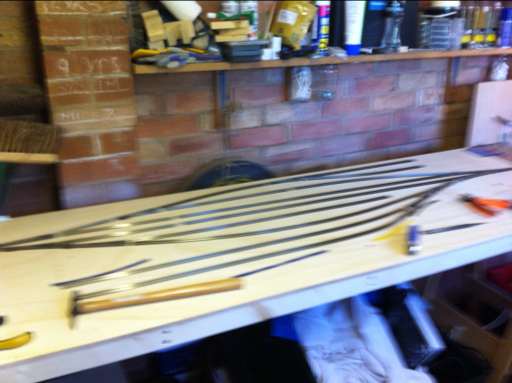 A prototype has been knocked up. The only other carrs that require couplings now are the bugs which are likely to be fitted with Greenwich ones. 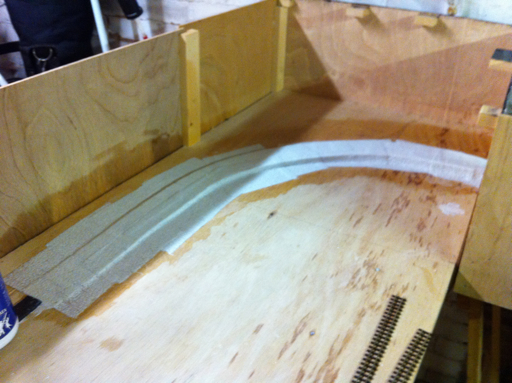 The next three days have been set aside for work on the hidden sidings wiring and alignment. Joy! 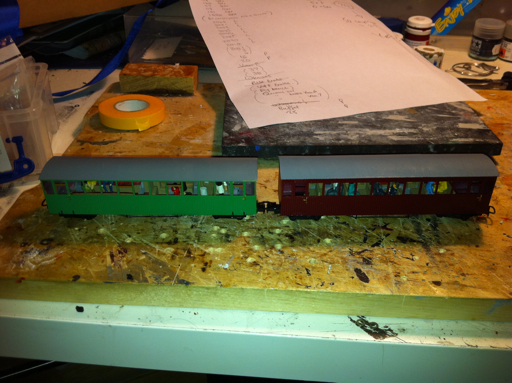 - 87 both sides with handrails on and misc other piping added. 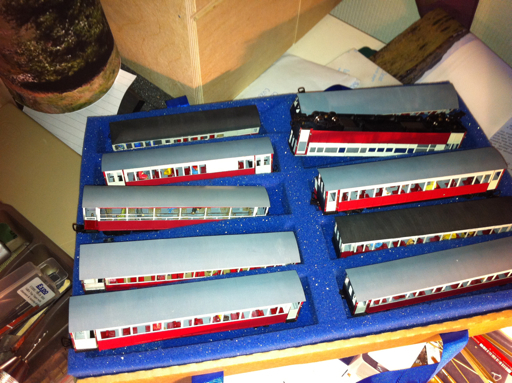 - Carr 26 with handles on and bogies. 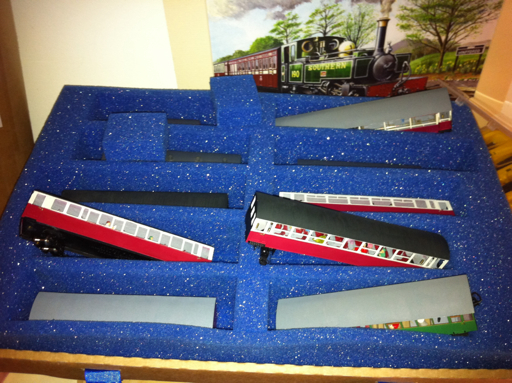 - two trays of carrs with bogies on and couplings! 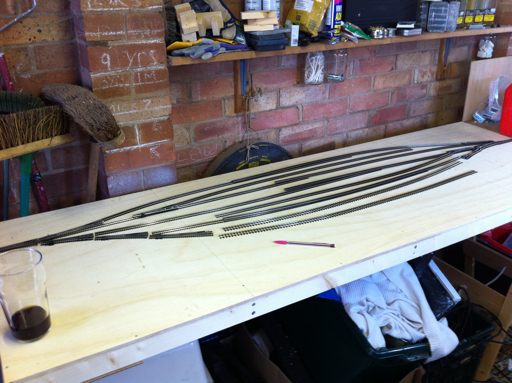 Here the pipework for the other side of 87 is coming together – ejector added with associated ‘U’ pipework etc and steam pipes into the smokebox. It seems that the WHHR have opened a secret extension to Glaslyn Junction using dual gauge track (2' and 4’) and borrowed rolling stock from the WHR. The first train enters the station hauled by 'Gelert' and comprising modern Romanian-built coach 2060. Also seen partly painted in Vale of Ffestiniog. 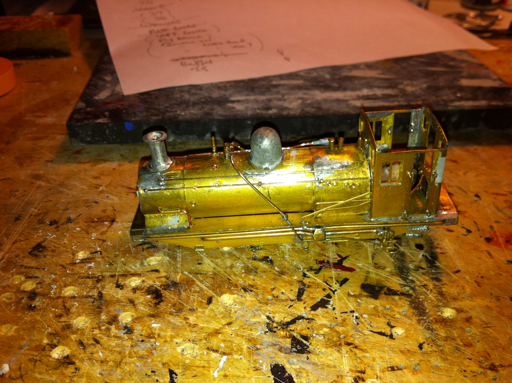 Actually, this was just test running 'Gelert' having done some work on the chassis. In other news K1 continues to make good progress and two Col. Stephens era FR carrs have had their white details and wooden droplights added.